Will The Mavs Beat The Heat? Dallas Takes 3-2 Lead In NBA Finals : The Two-Way Led by Dirk Nowitzki, the underdog team from Dallas could win the NBA title Sunday night against the superstar-driven and heavily favored Miami team, which boasts the talents of LeBron James, Dwayne Wade and Chris Bosh. Dirk Nowitzki of the Dallas Mavericks is defended by Joel Anthony of the Miami Heat during Game 5 of the NBA Finals at the AmericanAirlines Center in Dallas on Thursday (June 9, 2011). There are more than enough serious stories to post about today — Arizona wildfires, the blazing heat across much of the nation, the ongoing violence in parts of the Middle East and the upcoming release of thousands of emails from Sarah Palin's days as Alaska governor. We will get to all those. 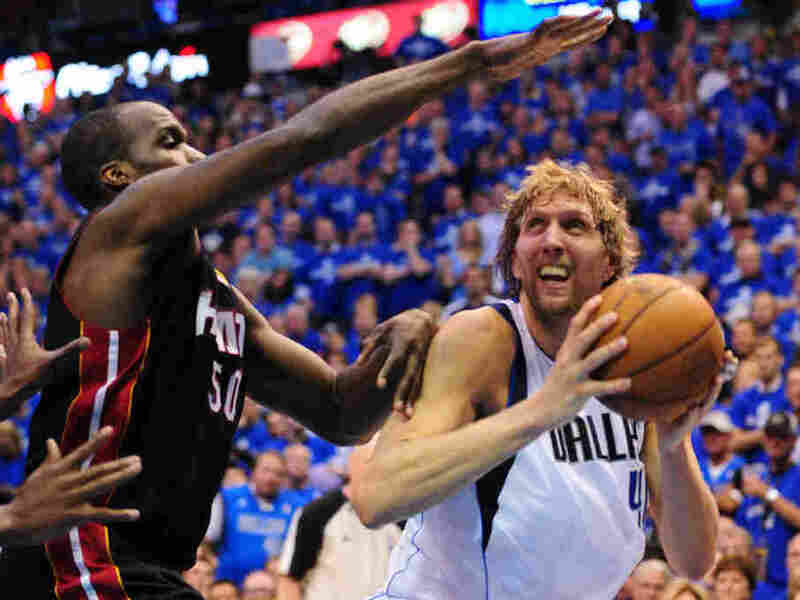 The Dallas Mavericks last night beat the Miami Heat 112-103 and took a three games to two lead in the NBA finals. That means the underdog Mavs could win the NBA title Sunday night against the superstar-driven and heavily favored Heat, who boast the talents of LeBron James, Dwayne Wade and Chris Bosh. Game six and game seven, if it's necessary, will be played in Miami. "James may be the only player in history who can be criticized after producing a triple-double of 17 points, 10 assists and 10 rebounds. But he was 8-of-19 from the field overall and 1-of-4 in the fourth, when he was outscored 8-2 in his matchup with Jason Terry." On Morning Edition, NPR's Tom Goldman told host Steve Inskeep that "Dallas has the momentum right now. The Mavs are the first team to finally win two in a row. Their great offense is great again." Dirk Nowitzki continues to play outstanding ball for Dallas. But, Tom added, "I think they have to win in game six, though. If it goes 7, maybe the Heat [will triumph]." Game six is set for Sunday at 8 p.m. ET (ABC Sports is the broadcaster). So, basketball fans, what's going to happen?